Finding a suitable bed for J has been a recurring mission since she outgrew her cotbed! There are some marvellous specialist beds out there on the market, but they can be pretty costly and as J doesn’t need many of the features (for example many people require profiling beds to change the angle of the mattress at head and/or knees or raise and lower the height of the mattress). Really all J requires is a way to prevent her from rolling out and hurting herself! 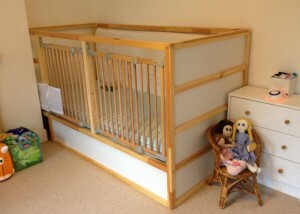 As she had been used to sleeping in a cotbed, a few years ago we decided to try and replicate that style of bed in a larger and more easily accessible way, by adapting a single bed to create the security of bed guards all around (while avoiding the dreaded ‘disability price tag’!). This solution worked really well! J had a full size single bed and space to stretch out again! Using the stair gates (which are of course designed to be child safe so minimal risk of anything getting trapped!) meant we didn’t have to lift her up and over the rail to get her into bed, and laterally she was able to get in with assisted standing transfers, so no lifting was required at all! However…. due to her development in mobility and that new ability to stand and transfer, also meant she was getting better able to stand herself up in bed using the gates to pull up on! This began to be a bit of a worry as she’s still a little wobbly and and on a soft mattress was more likely to fall. I was getting increasingly worried she would fall against the opposite wall or slide and get her legs stuck between the rails. We did try padding the back wall with a spare mattress, which may have worked long term if I’d found a satisfactory way to fix it, but J had too much fun pulling it down! We also could have tried extending the bumper between the rails, but I think this may also have created a new challenge to try and pull it off! Just before christmas we decided to give another solution a try, and have a go at an #ikeahack upgrade! We figured we could aways revert back to the original #ikeahack if mark II didn’t work out, so there was nothing to loose except a bit of faffing around! 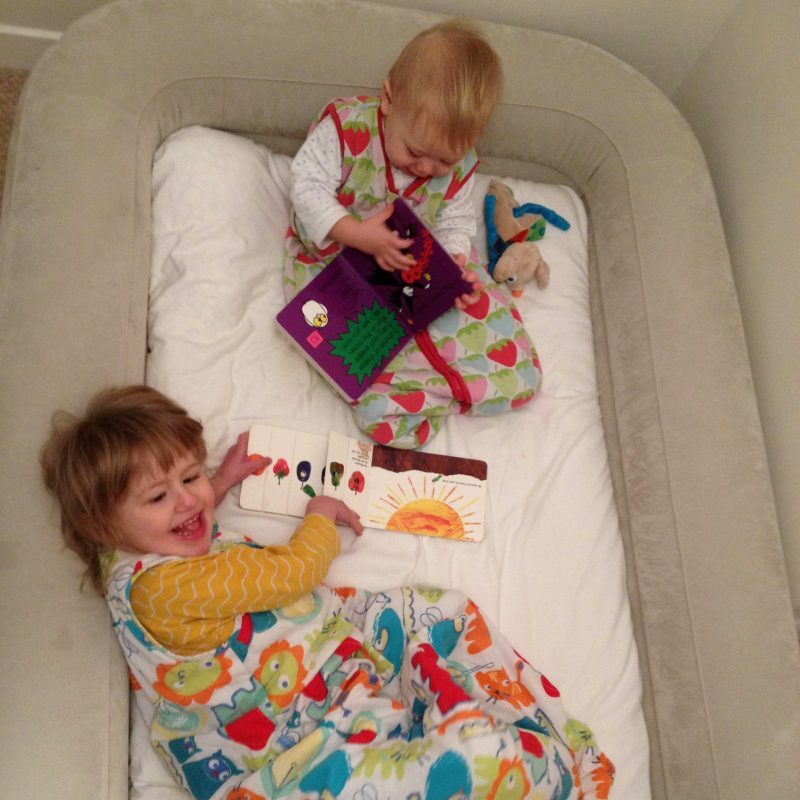 For sleeping away from home, J has slept in an airbed with a raised surround for quite a number of years (I wrote a little about her travel bed previously among some of our other favourite inclusive holiday products). There have only been a couple of occasions where J’s climbed out of it (of course this has usually been when we’ve gone out and left poor Granny babysitting and, in the spirt of all kids everywhere, it’s time to cause some mischief!). The success of this travel bed gave us the idea that perhaps a bed that was open, low to the ground with a bumper all around would be enough security. And so, for #ikeahack mark II, we simply removed the central post and the stair gates and dropped the level of the mattress! The nice thing about the Ikea Kura bed, is that it’s a reversible, high-low bed and therefore is designed to be used in different ways. Either as a regular height (low) bed or as a cabin (high) bed. 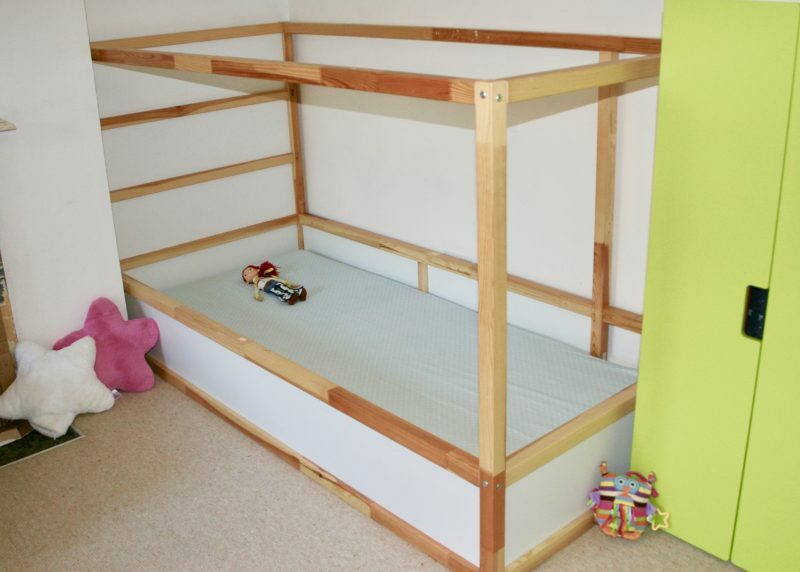 In order to provide a safe enclosure when the bed is in the high position, the frame, which forms the bed base, has solid vertical panels on all sides. You are supposed to fix the bed slats in the one pre-drilled position (as shown in the picture of W’s bed) and you can just place the mattress on the top whichever way up you choose to put the frame. One day I will get round to making some nice padded panels to soften the bed rails, but at the moment we are making do draping cot bed duvets over the sides. It’s taken me 4 months to write this up (I shall call that our test period! ), I’m delighted to proclaim this 2nd hack a success! 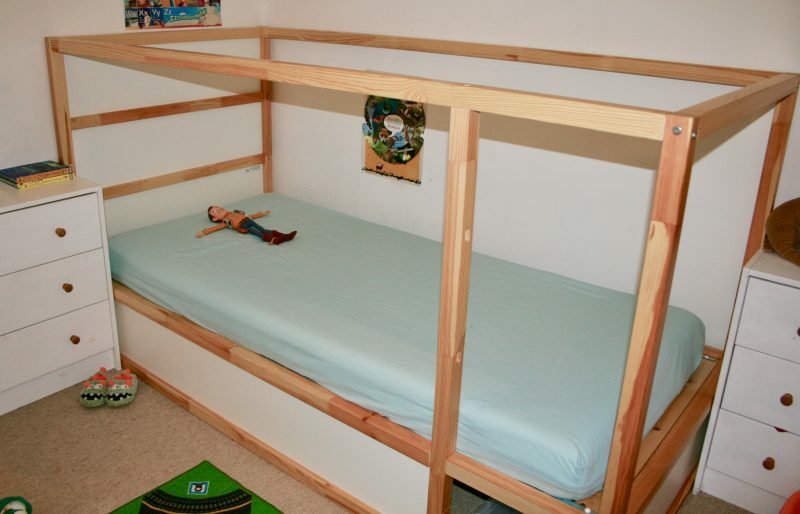 What a clever way to make a bed that truly suit’s your daughter’s needs! Yet another reason to love IKEA!!! Thank you! We are big Ikea fans! So much thought that you have to put into something which other people take for granted. Great creative solution! Thank you! Yes! There’s a lot of lateral thinking required to try to make life accessible & inclusive isn’t there!? That looks fab have you seen these bolsters that go under the fitted sheet. Could help for padding and acts in the similar way to the inflatable bed. Oh cool! Thanks for this link, I hadn’t seen these foam ones, only the inflatable kind! That might be a way to create a better, softer, bumper than my old cot bed duvets! This is incredible, we’ve also been searching high and low for something suitable for our boy on the spectrum and are in a similar position with the special needs beds having functions we don’t need. This is exactly what we’re after, safe & practical for our little nocturnal wanderer, thank you so much for sharing! Aw, that’s fabulous! So glad it’s been helpful!